Make Music Chattanooga is a live, free musical celebration on June 21, the longest day of the year, with concerts on streets, sidewalks, and parks across the city. The event came from Make Music Day, or Fêta De La Musique, a worldwide celebration of music. This event was started in France in 1982 and has grown to include over 700 cities in 120 different countries. Venues include: Aquarium Plaza, Bessie Smith Cultural Center, Carmike Majestic Parking Lot, Chattanooga Public Library, Cine-Rama, Coolidge Park, Feed Co Table and Tavern, Granfalloon, Miller Plaza and Riverside Wine and Spirits. The festival will take place from 12pm-10pm. CSO will introduce you to and let you play classical instruments and CGR will have the rock instruments on hand. Here you can get back to the roots of music and still rock. Adults and kids will have the opportunity to make a musical instrument, learn how to play it and the history behind it. The Chattery promotes learning in the community, so this will be a fun activity with something to learn. Walk to up and sing and/or play an instrument at one of our three Street Studios to be included in an original song created from the various samples recorded that day. Piano players of all ages will be performing in the piano park on Main Street brought to you by Buddy Shirk from Summitt Pianos. Community Karaoke – anyone can sing! Gig City Productions, Tennessee Valley Federal Credit Union and the River City Company are hosting a community karaoke lunch hour on the stage at Miller Plaza. Anyone can step and sing! Have your song ready and be ready to perform in front of a crowd…who knows, you may get discovered! Gig City Productions and River City Company have teamed up to bring all-day entertainment to Miller Plaza. Performances include: Stratton Tingle, Jamal Traub, Kindora, Rock Floyd, The Scarlett Love Conspiracy/Resurrection Mary, and a Grand Finale party with the Communicators featuring Ryan Oyer and Heather Holt. Food and alcohol available for purchase. To honor the memory of Prince we are inviting everyone, all the performers and all the fans who enjoyed Make Music Chattanooga that day to participate in the grand finale. At 10:00pm we will all sing along to 1999 in Miller Plaza. Bonus points for dressing in purple. The Chattanooga Public Library and the Fletcher Free Library in Burlington, VT, in cooperation with Big Heavy World, are coming together to celebrate music and technology. Musicians from both cities will perform together over the gigabit network using low latency software (LOLA). Headline performances from local musicians from both cities. 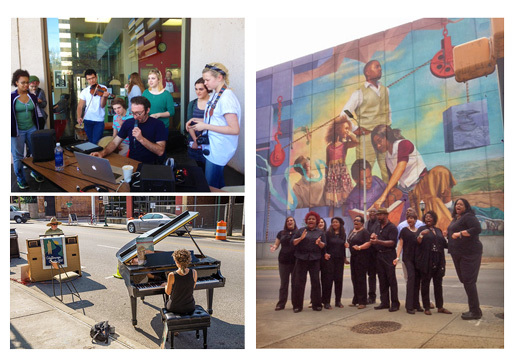 Open Mic Community Duets between the two cities – anyone can play! Bring your instrument. Make Music Chattanooga performers will be selling their merchandise (shirts, cds, stickers, etc.) to fans. The performers will keep 100% of the money from their sales. This is a great way to support the artists and get cool stuff.